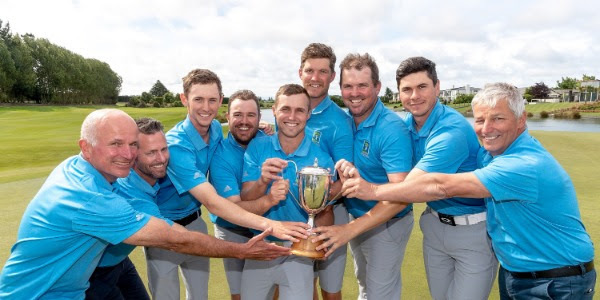 Northland Golf will never forget this day after claiming their first victory at the Men’s Toro Interprovincial in the tournaments 68-year history by defeating Auckland 3.5-1.5 in the final. The team of Luke Brown, Dale Clarke, Kadin Neho, Taylor Gill and Alex Neely came out of the gates firing after defeating local hopes Canterbury in a superb semi-final. After squeezing into the final four yesterday, the Northlanders used all that momentum and more to carry them home and complete a fairy-tale victory at the Clearwater Golf Club. It’s been a golden summer for the player of the tournament and Northland Stalwart, Dale Clarke who returned to the Interprovincials for the first time in 11-years to claim the individual honour with a record of six from eight which included two clinical victories today over Hiroki Miya (5&4) and Jang Hyun Lee (4&3) who beat him yesterday. “It’s an unbelievable feeling and I can’t explain it at this stage,” beamed the 33-year-old. This trophy adds to his collection after achieving the amazing double by becoming the New Zealand Mid-Amateur champion followed by winning the recent Australian Mid-Amateur Champion three weeks ago. Kadin Neho secured the Taniwha’s first point with a convincing victory over Johnny Tynan to calm the nerves before Clarke joined him. Things looked to be heading towards a number one showdown between Luke Brown and Jared Edwards before things started to unravel. It was the early matches that went the distance with Northland’s number five Alex Neely securing the match-winning point on the final hole to start the celebrations. He played his shot of the week when approaching into 17 which was converted with a clutch birdie when it counted. This ends a sensational week at the Clearwater Golf Club and will be remembered for years to come. We now move back to the North Island for the 2019 Toro Interprovincials which will be hosted in Hawkes Bay.